This momentous event happened over a month ago, but it was, as I mentioned, very momentous. It seriously was a huge milestone for me in my fitness journey, and I feel like the story must live on somehow. So, Interwebz, here you go. I knew I needed a goal to get my rear in gear about working out. 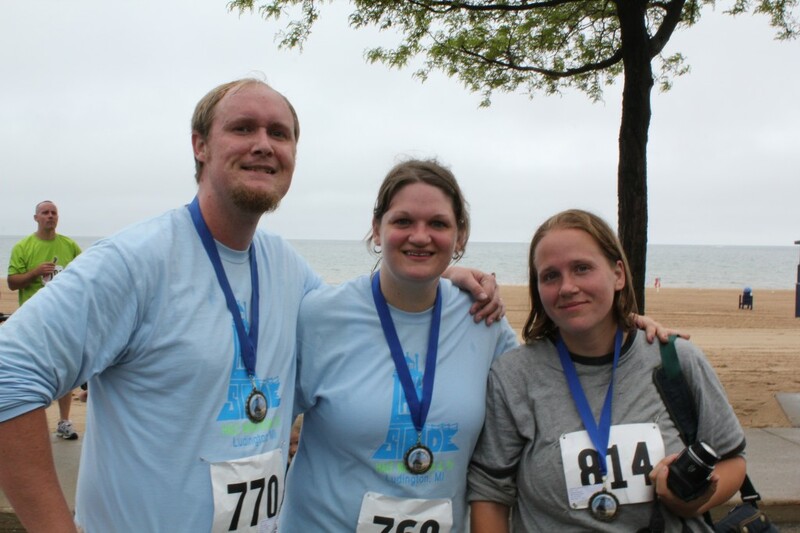 So, along with my hubby and my cousin’s wife, I signed up to run the Ludington Lakestride 5K in Ludington, Michigan. 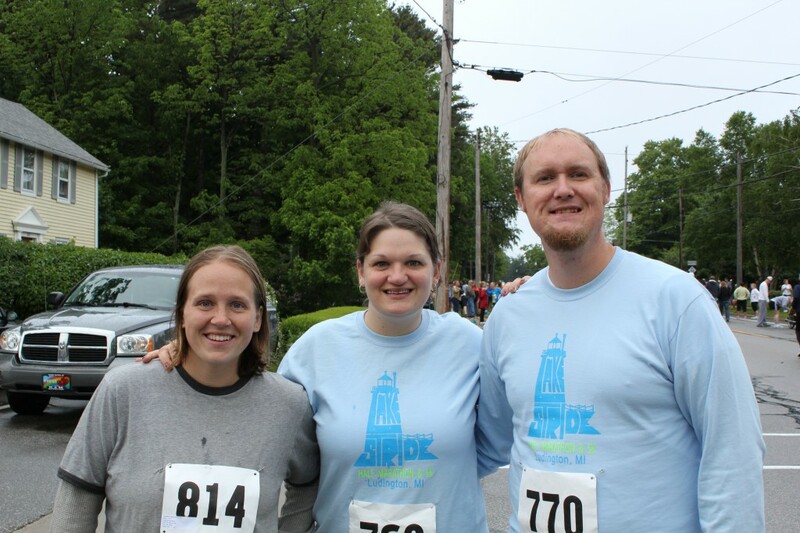 Once I became invested financially, I knew I had to finish, and try not to completely die at the finish line. I’ll go into greater detail on Couch-to-5K in a later post, but suffice to say, by the time June 11 came around, I had been able to run three miles (a 5K is 3.1) without stopping for about three weeks. I was still insanely nervous the morning of the race. 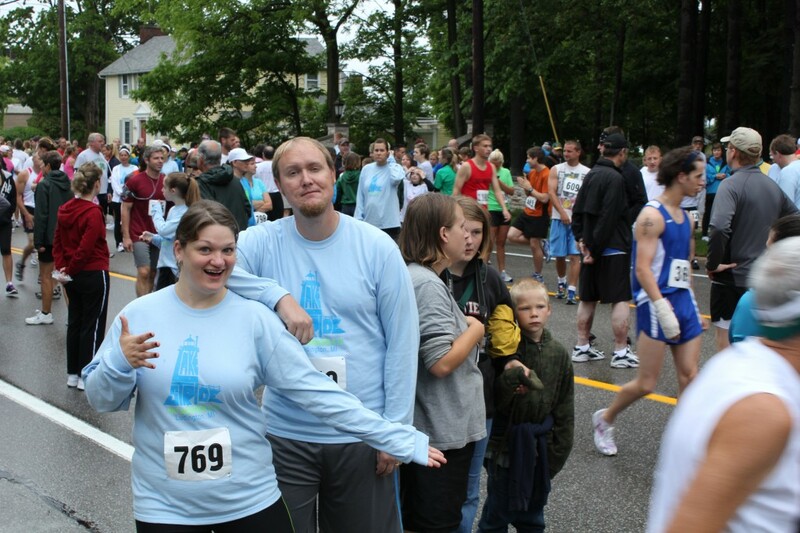 The day before, Steve and my sister, Becky, had scoped out the route after we’d registered and picked up our packets. I’m not sure how many people ran the race, but I think it was over 1,000. I was a bundle of nerves and energy, driving Steve and Becks crazy, I’m sure. I ate my usual pre-run snack: a banana and water, and we took off from the hotel for the start line bright and early to make sure we had plenty of time to park. At first, I felt incredibly awkward and out of place. I’m not a svelte athlete. I didn’t have fancy running clothes or refueling belts. It seemed like all the cool people had their bibs pinned to a pant leg, and mine was on my stomach. I hadn’t run a competitive race since 7th grade! What was I doing?? We clustered near the 11-minute-mile flag, where others of similar condition seemed to be. Finally, the gun went off, and off we went. As Steve and I jogged side by side, I suddenly thought, “Oh. I know how to do this. I’ve been able to do this for three weeks now!” And then I started enjoying it. We dodged people walking with strollers, scampered around slowpokes, and waved at all the spectators. I could see the junction up ahead where the 5K-ers turn to the right and the half-marathoners would keep going towards the state park. Then, about half a mile in, Steve pulled up short. He’d pulled a muscle in his leg. I was feeling fit as a fiddle, so I kept going, assuming he’d limp his way back to the finish line. I caught up with Amanda, and we ran together as the route entered a campground. Asphalt streets turned to mulch paths in the woods. Around the half-way point, Amanda took a break to catch her breath and I ran on ahead. Things started to get a bit dicey when I began the last mile at the bottom of a long hill. But I knew my time was pretty decent from the people they had posted at the mile markers calling out the times. 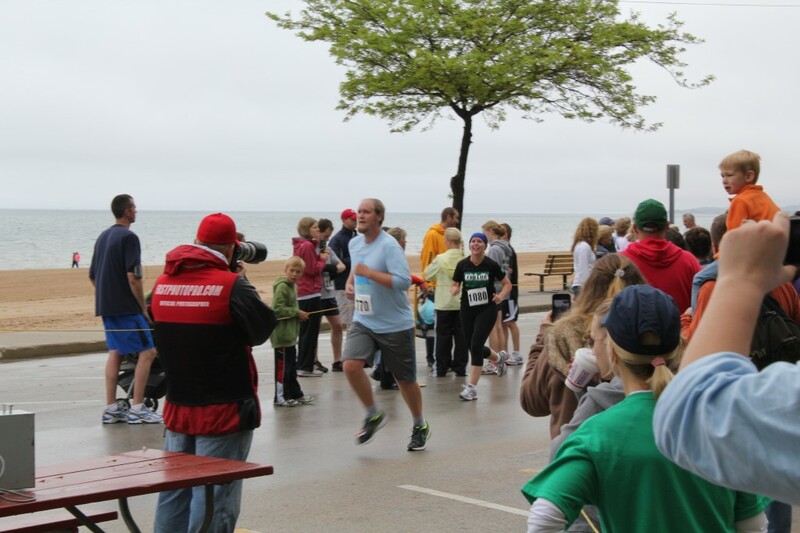 The last mile was a struggle, but once I got to the top of the hill, I could see the finish line up ahead, and Lake Michigan breezes were rolling in. Plus, a group of 10 year old girls were gaining on me, and I knew I couldn’t let THAT happen! I took deep breaths and counted my paces to stay in a rhythm. Once I rounded the turn into the straightaway, I started sprinting. I made it across the finish line in 33.12, just as the lake ferry, the Badger, was leaving the harbor, heading across the water to Wisconsin. It hooted at us. I was a little concerned when Steve was nowhere to be found. Becky and Amanda’s kids had seen no sign of him. Two minutes after I crossed the finish line, Amanda made her own triumphant finish, and a few minutes later, Steve came determinedly charging across. Injury or no injury, he was going to finish! We claimed our finisher metals, and enjoyed some of the complimentary refueling treats – more bananas, bagels, cookies, popsicles, etc. 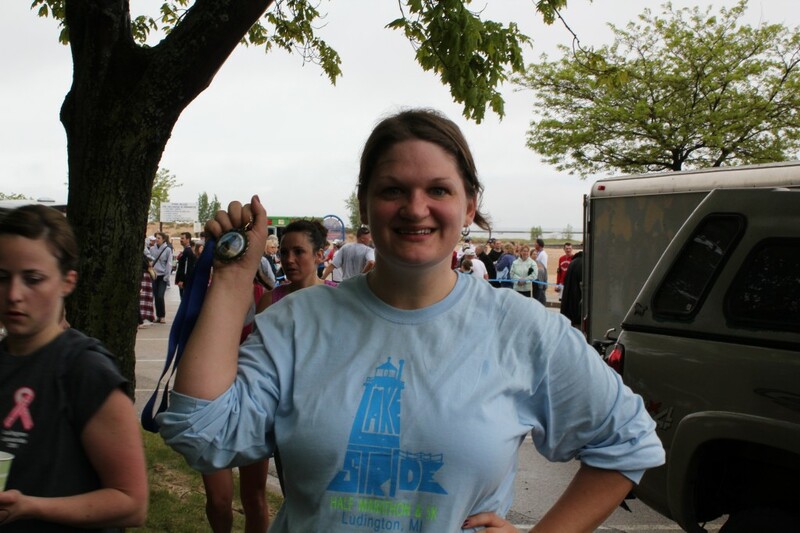 I was mostly just thrilled beyond belief that I HAD FINISHED A RACE!! I couldn’t believe it. And I was happy with my time, too. Afterwards, we still had enough energy to go for a hike in the state park. After a nice big pasta lunch at a local Italian place. And a tasty mocha at a cool coffee house. Love Michigan lake towns. 1. Training works. It really does. 2. Anyone can be an athlete. 3. Next year, I run the half-marathon. 13.1 miles? Piece of cake!